The broader stock market averages digested recent gains this week, as trading activity was shortened by the Martin Luther King Jr. holiday on Monday. Trade talks with China appear to have reached a stalemate, as U.S. Commerce Secretary Wilbur Ross said on Thursday that the two sides were “miles and miles” apart from settling trade issues. Back at home, the Federal government shutdown found a temporary solution on Friday. The deal re-opens government operations through Feb. 15, as Congress and the White House will continue to discuss border security. Despite the holiday, it was a busy week for earnings. International Business Machines (IBM) was the standout winner this week, gaining 8% a day after exceeding consensus expectations. On the other hand, Intel (INTC) talked down guidance with its quarterly report on Thursday. The pace of earnings reports will continue to accelerate next week, as Tuesday alone will see bellwethers and dividend aristocrats, such as 3M (MMM), Apple (AAPL), Pfizer (PFE) and Verizon (VZ), announce quarterly results. 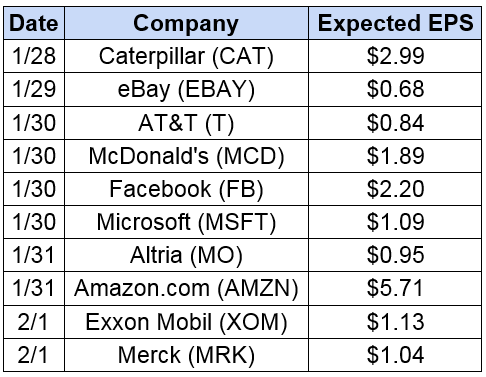 Facebook is the only one of the companies highlighted that’s expected to post lower earnings (by a penny a share) than the previous year. However, an important narrative of earnings season is that composite growth is expected to drop to 12% in the fourth quarter, after averaging more than 20% for the first three quarters of 2018. For the first time in a while, the FOMC’s interest rate decision on Jan. 30 is not attracting much attention from investors. 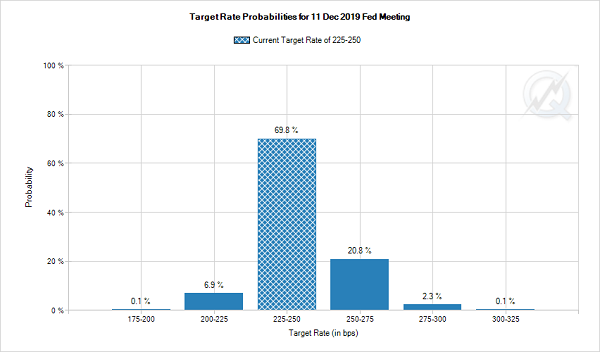 Fed funds futures are pricing in less than a 1% chance of a rate hike next week and just a 23% chance of an increase at any time in 2019, compared with a 7% probability for an interest rate cut. On the other hand, the January jobs report on Feb. 1 will likely be watched closely by investors. Following a huge upside surprise in the payrolls data last month, this report will be the first sign of whether the U.S. Government shutdown had a material effect on economic activity. This holiday-shortened week will likely be the calm before the storm, as the January jobs report and increased pace of quarterly earnings reports the next couple of weeks will likely go a long way to determining the investment story for the first few months of 2019. This can be especially troubling if you’re nearing retirement or already retired. All you really care about is generating consistent income and protecting your hard-earned nest egg, whether a company misses earnings expectations by a few pennies or there’s political trouble brewing thousands of miles away. Thanks to his work, you no longer have to settle for low bond yields, or “blue chips” like Intel that can fall as much in one day as they pay over an entire year in dividends.